Fans of Ricky Martin have been eagerly awaiting his return to the music scene. Well, the wait is over. The Latin sensation is back with his first English language CD in five years, since 2000's "Sound Loaded" album. He co-wrote most of the songs on this deeply personal album called, "Life." "I just let 'Life' happen," Martin told The Early Show co-anchor Julie Chen. "I was really in touch with my emotions. I think this album is very multi-layered, just like life is. It's about feeling anger. It's about feeling joy. It's about feeling uncertainty. It's about feeling. And all my emotions are part of this production." During the time away from the stage, Martin took a long trip to learn about other sounds and cultures. And the result is an album with a very international feel to it. "I took three years of my life just to do music, which was great," Martin said. "It was so great for me to do that, very healthy. I went to Brazil. I went to Egypt, India, Japan, just looking for sounds. I'm very happy." Besides co-writing many of the songs, Martin played a direct role in the record's production, working with some of the hottest names in the business. Guest artists on "Life" include Fat Joe & Amerie (on "I Don't Care"), Voltio (on "I Am"), and Daddy Yankee and Taboo from B.E.P. (on "Drop It On Me"). "It was not something that I was planning on doing when I started recording my music," Martin said. "Everything turned out to be so organic. I started recording my album. It was all about my emotions. It was about daring to write about them and turn them into music. Then one day I was working with Scott Stewart, for example, one of the producers and Fat Joe walks into the studio. 'What's this? I like this. Can I be part of it?' And that's what the creative process was about, to be open with no limitations. And it was very healthy." Portions of "Life" were recorded in Miami, Los Angeles and Cairo. "I believe this album is global," Martin said. "My dream is to unite lifestyles with my music. That's why I went from rock to Middle Eastern sounds, from Asian to hip-hop, from pop to Reggaeton, making it easy for people all over the world to relate." 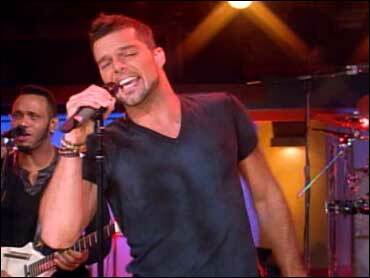 "Life" is the first Ricky Martin album since his worldwide smash, "Almas del Silencio" ("Souls of Silence") debuted at No. 1 on the Billboard Top Latin Albums chart with the largest first week's sales (65,063) of any all-Spanish language album in the SoundScan era in May 2003. Martin has sold more than 50 million albums worldwide. He won the Best Latin Pop Performance Grammy for "Vuelve," a full-length Latin recording at the 41st Annual Grammy Awards in 1999. It was during this show that he performed "The Cup of Life," kicking of Ricky Mania all over the world. "When I performed 'Cup of Life' at the Grammys," he said, "I had been singing that song for two years maybe. It felt very comfortable. What I'm trying to say, I walked on stage. I was there with my band. And all I wanted to do was have a good time. I guess that's what people enjoyed that evening. It was very special." Among Martin's numerous awards, he was named World's Best-selling Pop Male Artist and World's Best-selling Latin Artist at the 12th Annual World Music Awards. He was born Enrique Martin Morales on Dec. 24, 1971 in San Juan, Puerto Rico. He was a member of Menudo from 1984-89. He also acted on the TV soap "General Hospital" and on Broadway in "Les Miserables." For The Early Show, he performed his latest single, "I Don't Care," "The Cup of Life," and "It's Alright."